Raija Tammi received her M.D. from the University of Turku, Finland, in 1975 and her Ph.D. from the same University in 1981. Thereafter, she moved to the University of Kuopio, Finland, where she is an Assistant Professor in the Department of Anatomy. She spent a postdoctoral fellowship (1984-1986) in the Department of Dermatology, University of California at San Francisco (U.S.A.) and a sabbatical leave as a Research Fellow (1994-1996) in the Department of Biomedical Engineering, Lerner Research Institute, The Cleveland Clinic Foundation, Cleveland, Ohio, U.S.A. Dr. Tammi has studied the metabolism of hyaluronan in epithelial tissues. Her current work focuses on the role of hyaluronan in keratinocyte differentiation. Markku Tammi received his M.D. and Ph.D. from the University of Turku, Finland, in 1975, and 1979, respectively, and moved to the Department of Anatomy, University of Kuopio, Finland, in 1979, where he is an Associate Professor of Anatomy. He spent a postdoctoral fellowship (1984-1986) in the Department of Biochemistry, University of California at Berkeley (U.S.A.) and a sabbatical leave as a Research Fellow (1994-1996) in the Department of Biomedical Engineering, Lerner Research Institute, The Cleveland Clinic Foundation, Cleveland, Ohio, U.S.A. He has studied glycosaminoglycans of articular cartilage and, most recently, hyaluronan metabolism in epidermis. Skin forms the barrier between the external environment and the inside of the body. Skin is composed of two different tissues that are closely apposed to each other: a surface epidermis constructed from multiple layers of epithelial cells and an underlying dermis composed of dense connective tissue (Figs. 1 and 2). The epidermis has distinct strata of cells called keratinocytes. The bottom-most keratinocytes form the basal cell layer. Basal keratinocytes sit on a basal lamina, an acellular sheet composed of specialized collagens, multi-adhesive glycoproteins, and proteoglycans, which demarcates the junction of the epidermis with the dermis. Basal keratinocytes divide, with daughter cells migrating into the overlying spinous cell layer. Keratinocytes in the spinous cell layer subsequently move into a granular cell layer, and eventually move into the outer cornified layer of the epidermis. Basal, spinous and granular cells are alive, whereas the terminally differentiated cells of the stratum corneum (called corneocytes) are no longer vital. The epidermis is a continually renewing tissue, and the program of cell division and progression to a terminally differentiated corneocyte is very tightly regulated. Strong mechanical support in the epidermis is provided by an extensive intracellular network of keratin filaments that connect to cell-to-cell junctions (desmosomes) and basal cell-basal lamina attachments (hemidesmosomes) (Fig. 1). Fig. 1　Low-power transmission electron micrograph of adult human epidermis. Arrows indicate the location of the basal lamina, and the asterisk, the beginning of the stratum corneum. Arrowheads point to the desmosomal contacts between the keratinocytes. 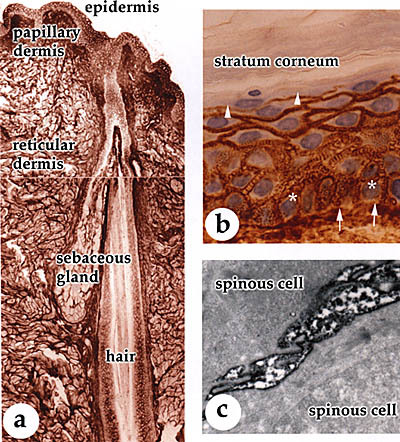 Reference slide illustrates the histology of normal human skin. Click here. Hyaluronan, known for 50 years to be a major constituent of the skin, was thought to be solely of dermal origin until recently, primarily because the dermis constitutes the bulk of the skin, and the role of hyaluronan in the formation of matrices in connective tissues was known. Furthermore, the extracellular space around keratinocytes in the epidermis appeared minimal (usually <1% of the volume) as observed in the electron microscope after conventional fixation and processing. However, the recent development of highly specific and sensitive techniques to localize hyaluronan in histological sections of tissues revealed unexpectedly high signals around keratinocytes in the epidermis (Fig. 2)1. Fig. 2　(a, b) Distribution of hyaluronan in adult human skin. Human skin sections were stained for hyaluronan using biotinylated G1 protein and link protein complex. The binding of the complex was visualized using the avidin-biotin-peroxidase technique (brown), and nuclei were counterstained with hematoxylin (in b, blue). A strong staining is present in epidermis from the basal layer (asterisk) up to the granular cell layer (arrowheads). 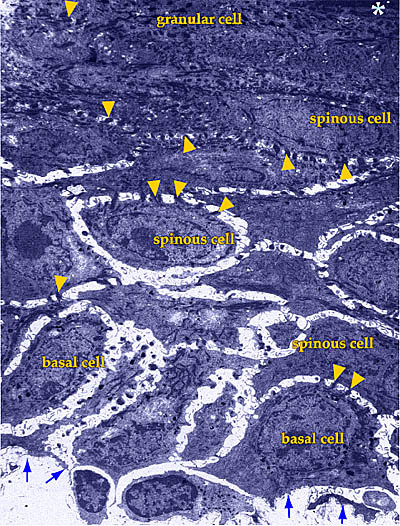 The connective tissue below the basal lamina (papillary dermis) is strongly positive, whereas the deeper connective tissue (reticular dermis) shows moderate staining intensity. Epithelial cells in the skin appendages (sebaceous glands and hair follicles) are also stained. Arrows in (b) indicate the basal lamina. (c) Ultrastructural localization of hyaluronan in human epidermis. Human skin sections were stained for hyaluronan as described, and then processed for transmission electron microscopy. The dark precipitate in the extracellular pouches between the keratinocytes indicates hyaluronan. Current research is defining the amounts of hyaluronan in the matrix around keratinocytes as well as the metabolism and biological functions of this macromolecule in the epidermis. Hyaluronan as a space-filling material and organizer of an extensive extracellular matrix is a straightforward concept in mesenchymal/mesenchyme-derived tissues such as the dermis and cartilage. The functions of hyaluronan are less obvious in epithelial tissues, in which the cells are closely spaced and appear to have very little extracellular space (Fig. 1). Indeed, a high concentration of hyaluronan would likely swell the extracellular spaces, possibly disrupting the cohesion between epithelial cells and compromising the epithelial permeability barriers. In view of this, it is not surprising that most simple epithelia, such as those in the normal gastrointestinal2, respiratory, and reproductive tracts, express little or no hyaluronan. On the other hand, the vital parts of stratified epithelia in skin and of the oral, esophageal, and vaginal mucosa all exhibit an intense pericellular signal when stained with a hyaluronan-specific probe prepared from cartilage aggrecan and link protein (see Hardingham, in this series). In addition, epidermis can now be separated from dermis by chelating divalent cations with solutions of EDTA, allowing the epidermal hyaluronan content to be measured accurately. Although the amount appears relatively low (0.1-0.2 microg/mg dry weight), its restriction to the small extracellular space of this tissue indicates that its concentration around the cells may be as high as 2.5 mg/ml, depending on the accuracy of current estimates of the extracellular volume. Organ cultures of skin have revealed that hyaluronan is not simply a passive, space-filling material in the matrices around the cells, but is in fact actively metabolized. For example, human skin explants incubated with [3H]glucosamine for 24 h followed by different chase times showed a half-life of about 1 day for both epidermal and dermal hyaluronan (Fig. 3)3. Fig. 3　The metabolism of hyaluronan in the epidermis. Explants of adult human skin were incubated for 24 h with [3H]glucosamine and chased for up to 4 days in organ culture. The epidermis was separated from the dermis with an EDTA solution, and the amount of 3H-hyaluronan recovered after various time periods is shown. The epidermis is a closed compartment, with no blood vessels, and molecules too large to penetrate the basal lamina beneath the basal keratinocytes cannot enter the tissue. An even tighter barrier is formed on the outer surface, since the layer of terminally differentiated keratinocytes (corneocytes in the stratum corneum) prevents even the transit of water. These two boundaries confine the entire metabolism, i.e., synthesis and catabolism, of the high molecular weight hyaluronan (>2 million Da) to the keratinocytes within the tissue3. No direct quantitative data are available to determine details of the catabolic mechanisms, but exogenous hyaluronan with a fluorescent label binds to the surface of keratinocytes in monolayer cultures and, in chase experiments, is taken up and degraded by the keratinocytes, presumably in lysosomes. Interestingly, reactive oxygen species (free radicals) mediate hyaluronan catabolism by keratinocytes, since free radical scavengers such as superoxide dismutase slow down the catabolism of endogenous hyaluronan in the epidermal compartment when added to human skin organ cultures4. Epidermal structure, thickness, and keratinocyte turnover rate vary according to the developmental stage and physiological state of the tissue. Hyaluronan is closely involved in keratinocyte proliferation, migration, and differentiation, and therefore participates in all these regulatory changes. Accordingly, its metabolism is controlled by such signaling molecules as hormones, cytokines, and growth factors. Retinoic acid is an inhibitor of epidermal terminal differentiation, reducing the number of desmosomes between keratinocytes, inhibiting the synthesis of keratins that are associated with maturation and death of the outer keratinocytes, and preventing formation of a structurally and functionally normal stratum corneum. Retinoic acid stimulates the synthesis of hyaluronan and doubles its content in the epidermis in human skin organ culture5. The intercellular spaces that fill with hyaluronan as a result of retinoic acid treatment perhaps contribute to the reduced numbers of desmosomes and prevent the tight adhesion of keratinocytes, thus inhibiting proper terminal differentiation. Hydrocortisone (cortisol) is widely used as an anti-proliferative and anti-inflammatory agent in skin diseases. Hydrocortisone inhibits hyaluronan catabolism at all doses, and at pharmacological doses, also inhibits hyaluronan synthesis6. Thus, physiological doses stabilize hyaluronan concentrations in the epidermis, whereas pharmacological doses actually reduce the content of hyaluronan and enhance normal differentiation. The fact that, at pharmacological doses, retinoic acid and hydrocortisone show opposite effects on both hyaluronan synthesis and epidermal differentiation supports the possibility that hyaluronan inhibits terminal differentiation such that reduction or removal of hyaluronan is one of the requirements for this process. Epidermal growth factor (EGF) and transforming growth factor alpha (TGF-alpha) facilitate wound healing and re-epithelialization by stimulating keratinocyte proliferation and migration. A well-known general function of hyaluronan is its ability to stimulate cell migration. The tendency for EGF to inhibit terminal differentiation and to increase synthesis of hyaluronan fits the general pattern noted in hydrocortisone and retinoic acid treatments, further strengthening the concept that enhanced hyaluronan synthesis is associated with delayed cornification of keratinocytes and subsequent epidermal thickening, whereas terminal differentiation correlates with reduced synthesis and increased clearance of hyaluronan. Most fetal tissues are very rich in hyaluronan, which forms a gel-like, highly hydrated matrix that provides the space and plasticity required for the rapid proliferation and migration of the embryonic cells. Early in the differentiation of embryonic skin, both the mesenchymal and ectodermal compartments contain high concentrations of hyaluronan in their matrices, which decrease greatly during tissue morphogenesis. Further, with advancing differentiation, the interactions of hyaluronan with receptors on the cells and with extracellular matrix molecules are profoundly changed. The hyaluronan receptor CD44 is particularly important in epidermal differentiation. A specific large variant of CD44 referred to as epican and other smaller splice variants are very abundant on keratinocytes in the epidermis. The mature CD44 molecules are heavily glycosylated with polylactosamine chains composed of repeating disaccharide units (N-acetylglucosamine-galactose) and a single heparan sulfate chain. This makes CD44, particularly epican, one of the major 35S-sulfate-labeled proteoglycans in human epidermis7. Early in development, human skin is covered by two cell layers: the epithelium, facing the undifferentiated mesenchyme, and the periderm, facing the amniotic fluid. Both cells display hyaluronan on their surfaces8, but no CD44 receptors. The CD44 receptors appear on the epithelial cells only when a set of stratification genes (e.g., specific keratin types) are activated, and the first intermediate cell layer emerges directly above the basal cell layer. This finding is consistent with observations in adult epithelia, in which CD44 and hyaluronan are abundant in stratified, but not simple, epithelia. This suggests that this hyaluronan receptor is a marker for epidermal growth and normal differentiation. Interestingly, loss of keratinocyte differentiation in advanced squamous cell carcinomas is associated with down-regulation of CD44 and hyaluronan loss from cell surfaces. The ectodermal parts of the skin appendages (i.e., hair follicles, sebaceous glands, and sweat glands) evolve by sequential inductions from the primordial epithelium. The first morphological sign of induction of these tissues is the formation of a tightly packed aggregate of epithelial cells, with the concomitant loss of hyaluronan and CD44. Similar cell aggregations occur during cartilage induction in the limb bud mesenchyme (Toole, later in this series). For whatever reason, when tight cell-cell adherence is needed, the production of epithelial hyaluronan and its CD44 receptor appear to be inhibited. One of the obvious tasks for hyaluronan is maintenance of some extracellular space between the lower cells in the stratified structure of the epidermis to facilitate diffusion of nutritional supplies to and waste products from the upper cells. The tendency of this space to swell because of the presence of the high hyaluronan concentrations may destabilize desmosomes and adherens junctions between adjacent cells and enhance their turnover. Hyaluronan may thus facilitate the constant cellular remodeling through the lifetime of a keratinocyte, emerging from division of a columnar basal cell and ending as a flattened corneocyte. After cell division, daughter keratinocytes are either retained in the basal layer or migrate upward to undergo terminal differentiation and finally cornification (an apoptosis-like process). The timing of cornification determines the thickness of the epidermis. All factors that control the onset of cornification are not currently known, but recent research suggests that attachment to the matrix through specific cell surface receptors is one of the requirements for connective tissue cell growth and survival. Epidermal keratinocytes in the suprabasal cell layers have hyaluronan as their predominant extracellular matrix component. Current data are consistent with the possibility that hyaluronan interacting with its cell surface receptors serves as a survival signal for keratinocytes and delays terminal differentiation. The receptor for hyaluronan-mediated motility (RHAMM) enhances the motility of many mesenchymal cell types through its tyrosine kinase activity, which is associated with enhanced focal adhesion turnover and signaling pathways involving ras and fak9. Keratinocytes react to exogenous hyaluronan through this pathway, as shown by the ability of a neutralizing antibody to RHAMM to block signaling. Moreover, transgenic mice with inhibited expression of RHAMM in epidermal keratinocytes show delayed wound healing, suggesting that cell migration in the re-epithelialization phase is not functioning properly. Mice in which the epidermal CD44 receptor is inhibited are also incapable of a brisk response to wounding. These results suggest that RHAMM and CD44 are involved in the migratory signals stimulated by hyaluronan in keratinocytes. Hyaluronan, an effective scavenger of free radicals, may also serve a protective role in epidermis by scavenging reactive oxygen species generated by ultraviolet radiation. The rapid turnover of hyaluronan may help to remove and clear noxious compounds from the epidermis. Cells belonging to the immune system (e.g., Langerhans cells and lymphocytes) move in and out of the epidermis. Hyaluronan creates extracellular spaces that facilitate the movement of these cells and provides low-affinity binding sites for their CD44 receptors. In organ culture models, keratinocytes usually require support and signals from an underlying layer of feeder cells to go through the normal differentiation program. To avoid the complications introduced by the feeder cells for routine experimentation, we have studied a keratinocyte cell line originating from newborn rat epidermis. This line undergoes essentially normal morphological stratification and differentiation without feeder cells10. This kind of "organ culture" is initiated by seeding the keratinocytes on a reconstituted native collagen mat formed on a porous membrane insert. When cultured at an air-liquid interface, the cells form a normal stratum corneum with 3-5 vital cell layers in ~10 days (Fig. 4a). The cells exchange nutrients and waste products with the medium through the intervening collagen mat and insert membrane, just as they do in vivo. The collagen substratum is porous, and in normal epidermis, the basal keratinocytes are attached to a continuous basement membrane that separates them from the collagen in the underlying dermis. Thus, the collagen substratum was modified by first allowing MDCK epithelial cells to assemble a natural basement membrane on its surface before removing the MDCK cells and seeding the keratinocytes. 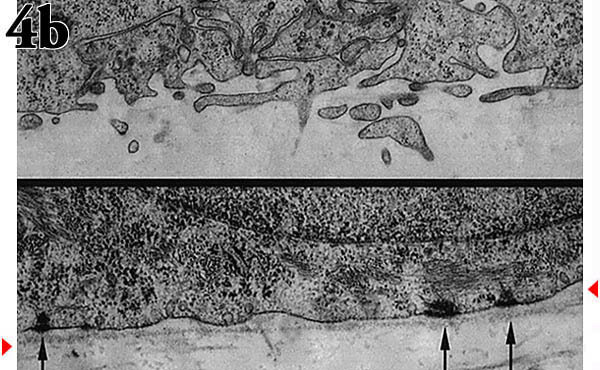 A comparison of the basal cell interface with the two substrata shows normal hemidesmosome attachments to the intervening basement membrane in distinct contrast with the blebbing and protrusion of the cell membrane in its absence (Fig. 4b). Fig. 4　An organ culture model to explore the importance of hyaluronan metabolism in epidermis. (a) Transmission electron micrograph of the "epidermis" formed when the keratinocytes were cultured on a collagen-coated membrane insert at an air-liquid interface. (b) Transmission electron micrograph of the interface between basal keratinocytes and the underlying collagen mat with (bottom) or without (top) an intervening basement membrane. The arrows indicate the hemidesmosomes and the arrowheads the basement membrane. Localization of hyaluronan in sections from the two types of cultures shows the containment of the hyaluronan when the basement membrane is present (Fig. 5). Sections were prepared from keratinocyte cultures grown on a collagen mat either with (bottom) or without (top) an intervening basement membrane and stained with the hyaluronan-specific probe. 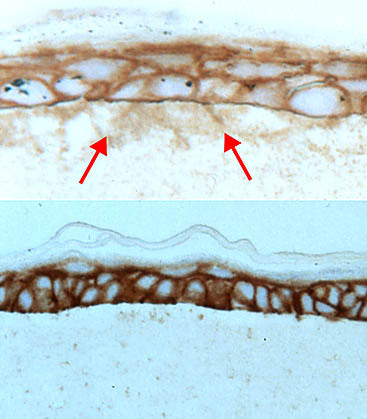 Arrows indicate hyaluronan in the underlying collagen layer when the basement membrane is absent. This containment has a marked effect on metabolism of hyaluronan. Stratified cultures of epidermal keratinocytes on basement membrane leak very little hyaluronan into the underlying matrix and culture medium as compared with cultures without basement membrane (Fig. 6). Further, the hyaluronan concentration is consequently much higher around the cells in the cultures with the intervening basement membrane and reaches a level corresponding to that of epidermis in vivo. Hyaluronan turnover in this system is even faster than in human epidermis in organ culture, since a steady state of [3H]glucosamine-labeled hyaluronan in the epithelium is reached in ~10 h (Fig. 6). Synthesis, catabolism, or both are thus regulated by keratinocytes to achieve a homeostatic equilibrium. Contents of [3H]glucosamine-labeled hyaluronan in the isolated cell layers of stratified and differentiated cultures grown on substrata either with (blue symbols) or without (red symbols) an intervening basement membrane. Labeling was started at time zero and terminated at the indicated times. The plateau values represent ~70% or ~20% of the total labeled hyaluronan in the cultures at the 24 h time point. Hyaluronan is present at very high concentrations in the narrow extracellular space between the stratified keratinocytes of epidermis and has a turnover time of less than 1 day. This dynamic metabolism suggests that hyaluronan is a space filler involved in the upwards migration and shape changes of the differentiating keratinocytes, that it provides extracellular space for the exchange of nutritional and regulatory metabolites for the upper spinous cells, and that it acts as a signaling ligand to enhance keratinocyte motility and survival. 1. Tammi R, Ripellino JA, Margolis RU, and Tammi M: Localization of epidermal hyaluronic acid using the hyaluronate binding region of cartilage proteoglycan as a specific probe. J. Invest. Dermatol. 90: 412-414, 1988. 2. Ropponen K, Tammi M, Parkkinen J, Eskelinen M, Tammi R, Lipponen P, Agren U, Alhava E, and Kosma V-M: Tumor cell-associated hyaluronan as an unfavorable prognostic factor in colorectal cancer. Cancer Res. 58: 342-347, 1998. 3. Tammi R, Saamanen A-M, Maibach HI, and Tammi M: Degradation of newly synthesized high molecular mass hyaluronan in the epidermal and dermal compartments of human skin in organ culture. J. Invest. Dermatol. 97: 126-130, 1991. 4. Agren UM, Tammi RH, and Tammi MI: Reactive oxygen species contribute to epidermal hyaluronan catabolism in human skin organ culture. Free Radic. Biol. Med. 23: 996-1001, 1997. 5. Tammi R, Ripellino JA, Margolis RU, Maibach HI, and Tammi M: Hyaluronate accumulation in human epidermis treated with retinoic acid in skin organ culture. J. Invest. Dermatol. 92: 326-332, 1989. 6. Agren UM, Tammi M, and Tammi R: Hydrocortisone regulation of hyaluronan metabolism in human skin organ culture. J. Cell. Physiol. 164: 240-248, 1995. 7. Tuhkanen A-L, Tammi M, and Tammi R: CD44 substituted with heparan sulfate and endo-beta-galactosidase-sensitive oligosaccharides: A major proteoglycan in adult human epidermis. J. Invest. Dermatol. 109: 213-218, 1997. 8. Agren UM, Tammi M, Ryynanen M, and Tammi R: Developmentally programmed expression of hyaluronan in human skin and its appendages. J. Invest. Dermatol. 109: 219-224, 1997. 9. Hall CL, Wang C, Lange LA, and Turley EA: Hyaluronan and the hyaluronan receptor RHAMM promote focal adhesion turnover and transient tyrosine kinase activity. J. Cell Biol. 126: 575-588, 1994. 10. MacCallum DK and Lillie JH: Evidence for autoregulation of cell division and cell transit in keratinocytes grown on collagen at an air-liquid interface. Skin Pharmacol. 3: 86-96, 1990.